If x and y are both integers, what is the value of x-y? When you see a GMAT Exponents question a few things should be coming to mind: The bases, factoring, and special quadratics. In this question you should notice that all of the bases are powers of 2. You might consider getting all of the bases to be the same so that you can do some factoring. 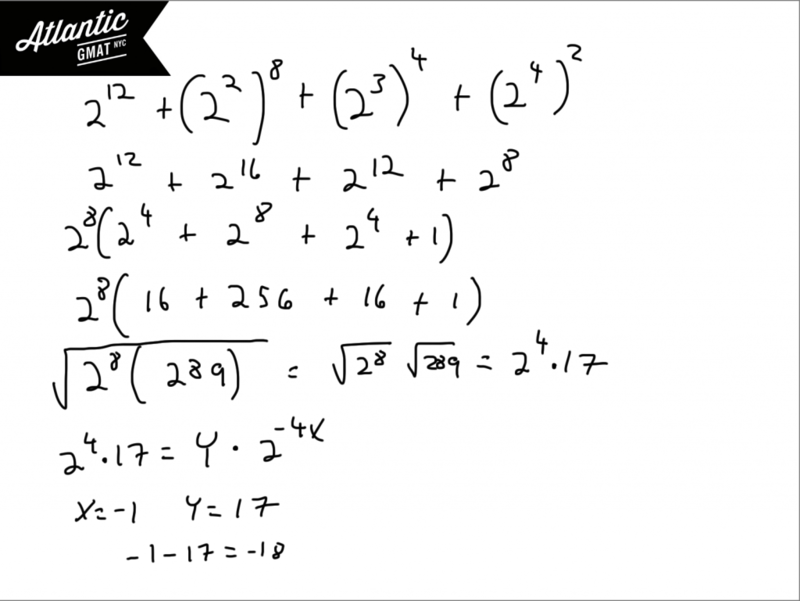 Ultimately you want to eliminate the addition so that you can deal with the square root. There's a pretty good chance that something nice is going to happen with the square root considering that all of the answers are integers. Once you get all of the bases the same you can factor out the smallest one, 2^8. Then all of the exponents in the parenthesis can be resolved. The parenthesis is equal to 289 which is a perfect square. 2^8 is also a perfect square as is any integer raised to an even power. At this point you can deduce that y must be equal to 17 and x to -1. So -1 - 17 = -18. These questions are considered tough but should be your bread and butter!